JNN 08 Jan 2014 London : Britain’s Prince Harry has been told by his grandmother, the Queen, to shave his beard, British press reported on Sunday. Harry has promised to obey the royal command, “but not until after his girlfriend Cressida Bonas had seen it,” the Sunday Express reported. The prince first began growing his beard in December while on a charity trek to the South Pole. When he returned to Britain in time for Christmas, he was dubbed “Prince Hairy” by his cousin Zara, a royal insider told the newspaper. “The Queen soon let her displeasure be known. 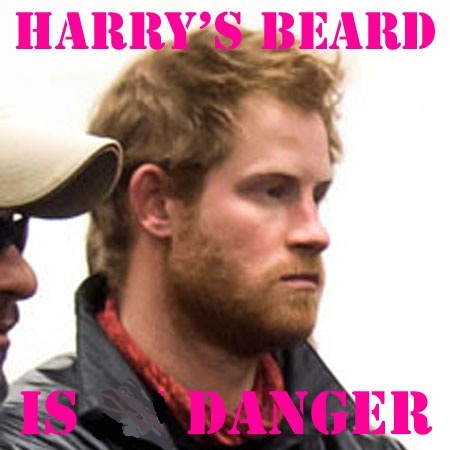 She doesn’t mind royal men growing beards when they are away in the Armed Forces or out in the wilds like Harry was in the Antarctic, but she expects them to be clean-shaven when they get home. “Royal staff are not supposed to grow beards or moustaches and she probably thinks it is difficult to enforce that rule when her own grandson has a beard.,” the insider added. Harry is expected to shave it soon, according to reports. It looks that the Queen is not only afraid of the Beard but , she is also Islamophobic , and to Nip in the Bud , as she thinks that if even there is any soft corner for Islam , in the hearts of the Young Generation Monarchy , so it should be wiped out , otherwise it will not only be the Britian which will be a Muslim State , in the upcoming future , but even the British Monarchs race may convert to Islam, which she is not ready to accept , as she must have an eye on the Past , when Romans have converted to Islam . This entry was posted in Europe and tagged Britain’s Prince Harry, Cressida Bonas, Queen. Bookmark the permalink.